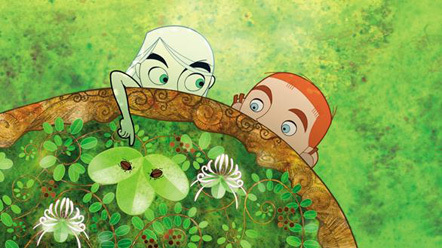 There are many reasons to love the new animated film The Secret of Kells, and not least is the way it portrays nature. 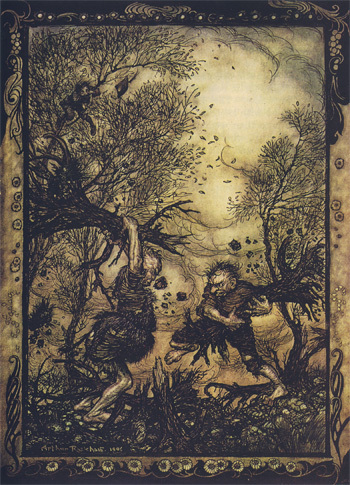 More than just a picturesque backdrop, nature plays an integral part in the story, and is practically a character in itself, personified by the forest sprite Aisling. She is a vibrant presence in the film, both childish and wise, who protects the forest and yet is vulnerable to the dark forces that lurk there. 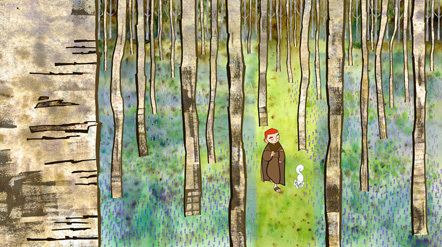 She teaches Brendan, the cloistered hero of the film, about the beauty of her forest as well as the dangers. 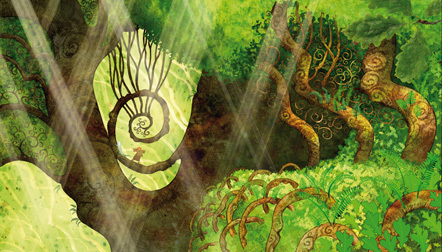 The visual portrayals of the trees and plants are spectacular, and the stylized lines and animation make you feel the growing, thriving life that dwells within. In one scene, Brendan scales an impossibly tall and twisted growth of trees to find the small berries that grow at the top, and the symbolism of life and rebirth is subtle but powerful. The film is filled with such small moments, that add up to a collective tapestry of the natural world as a vital force all around us. 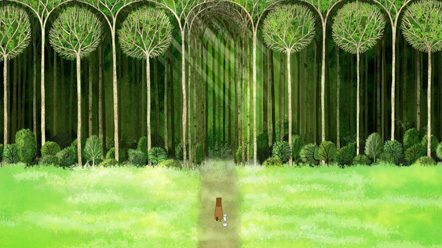 The book that Brendan helps to create not only contains images inspired by the forest, but the inks are made from ingredients found there. Nature inspires art, in more ways than one. Below are some more images from this magical film. 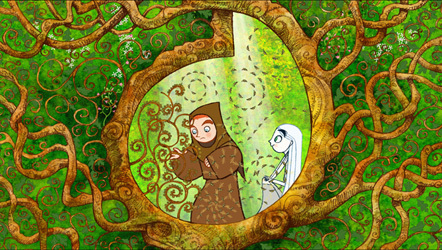 If you want to read more about The Secret of Kells, I wrote about it over at the Creative Juices blog. Better yet, go see it! 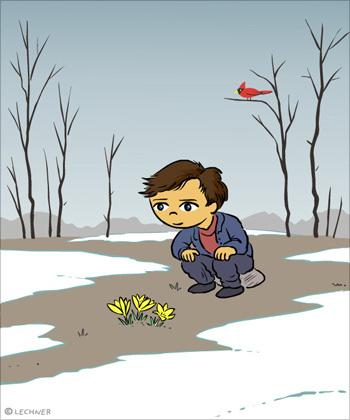 To celebrate the first week of spring, here is a drawing I did recently for the Creative Juices blog, for our “What The Doodle”. The word to illustrate for that week was “welcomed” and what could be more welcome than the flowers in spring? Spring is one of the most visually stimulating seasons (at least in cooler climates) because it changes so quickly, often from one day to the next. 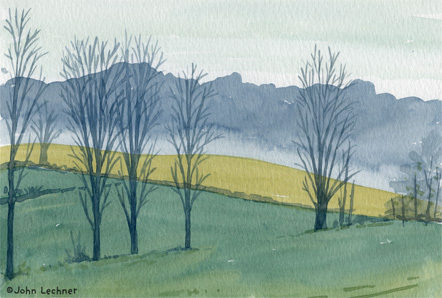 The grass turns from dull gray to green, the trees form buds, then flowers, then leaves. Tulips and daffodils bloom, along with forsythia, azalea and fruit trees. Birds become more active and plentiful. Everywhere you go, nature is coming back to life, if you know where to look. But make sure you look fast, because if you blink, you’ll miss it. As a gardener and nature-lover, spring is my favorite season. But I’m in no hurry to shake off winter just yet. True, it’s got snow, and ice, and freezing temperatures (at least up north), and everything seems dead and bare. But it also provides a nice break, a time for thinking and looking inward. In many ways, I find it the most inspiring season of all because of its minimalism. It doesn’t overwhelm the senses with color, it’s not splashy or teeming with distractions. In the winter, a twisting tree branch or a peach sunset can be a small masterpiece. A single red cardinal is like a miracle. 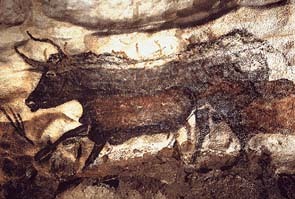 And knowing that nature is only sleeping, that life is still there hidden beneath the bark and under the ground ready to sprout again, can give you a feeling of hope that anything is possible, that any difficulty or situation can be overcome. So while I’ll be happy when spring arrives, I will still savor the end of winter while I can. For I know that it’s only a temporary situation, and spring is just around the corner. It has been exactly three months since I started this blog, and I want to thank all my readers for their feedback and support. I have lots of ideas for the new year, and here’s just a peek at what’s coming up. January will be “snow month” at The Untended Garden — all the posts will involve snow and winter. Snow has always inspired art and writing, not just for its visual beauty, but how it changes the way we see nature, making everything seem new. It has also been used as a metaphor in countless ways, as something that both hides and reveals, that protects and threatens. Another theme that I will delve into next year is the ocean, which is a huge part of our planet (two thirds of it!) and also has inspired writers and artists for centuries. 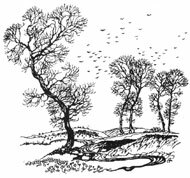 I will also feature a wide variety of media, including novels, poetry, picture books, drawings, paintings and films that deal with nature. I hope you can join the conversation, as we continue on our voyage of discovery! Many people stop looking at trees after the leaves fall off, but this is when I think trees become the most interesting. 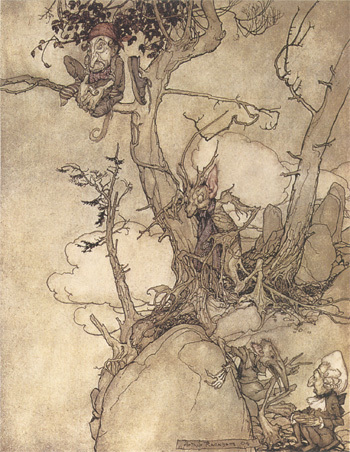 And one of the best artists at interpreting trees in all their raw, twisted glory is the great Arthur Rackham (1867-1939). 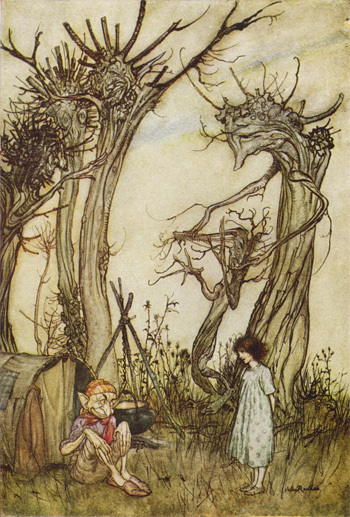 He was famous for illustrating classic fantasy and children’s books such as Alice’s Adventures in Wonderland and Peter Pan in Kensington Gardens, and influenced generations of artists who came after him. 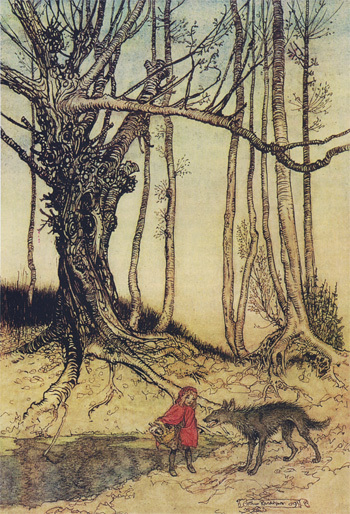 His trees are especially unique, and often become characters in the story. 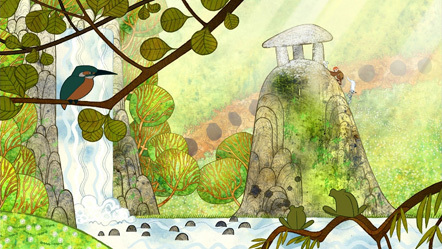 The world of humans and nature come together, and it is often hard to distinguish between his whimsical characters and their surrounding landscape. He had a flair for making his trees seem like living creatures, often literally with faces and arms, but also just by their organic and sinewy shape, as they grip the earth with their claw-like roots. So the next time you go walking in the winter, stop to notice the trees, and you may be pleasantly surprised. 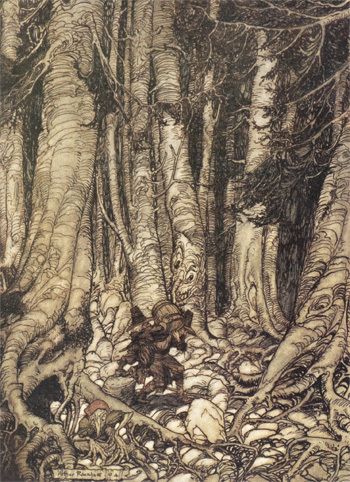 I will discuss more of Rackham’s work in future posts, but in the meantime, here are just some of his amazing trees. 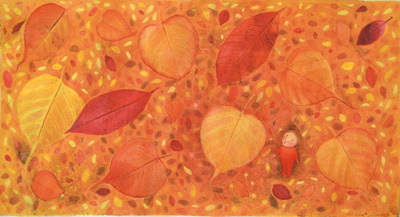 Autumn is fast disappearing, as the few remaining leaves manage to cling to the trees. It is a season of transition, all the more precious because of its fleeting nature. 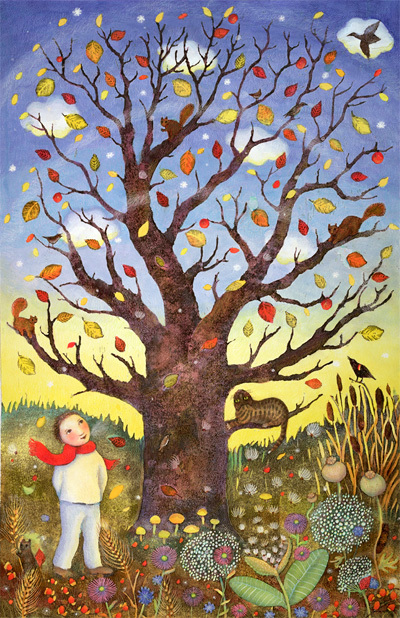 Here are some beautiful fall images by artist Kristina Swarner that perfectly evoke the feeling of autumn, when leaves are turning, seeds are scattering, and birds are flying south. 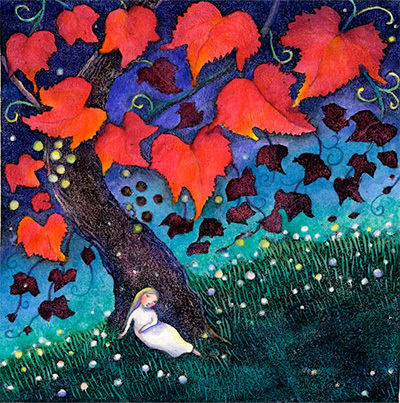 Kristina is the illustrator of several children’s books, and her lyrical work is very much inspired by nature. You can see more of her work at her website. 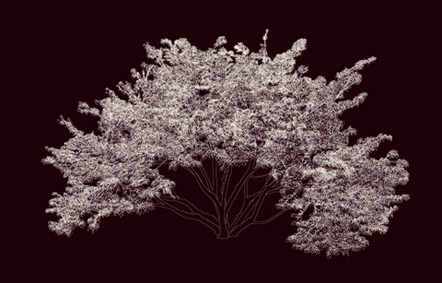 What is “nature?” What is “natural?” These questions are increasingly difficult to answer as the borders of the natural and artificial continue to blur. As the sphere of human influence grows larger, questions about our relationship to the “natural” and our place in it prove ever more pressing. The digital medium describes all things equally; the near and the far, the large and the small, without the prejudice inherent in our familiar acts of looking. The idiosyncrasies of my hand trace over photographs taken from multiple points of view. Through the process of zooming in and out, the drawings capture information outside the experience of the human eye or camera. The closer one gets to these works, the more one can see. 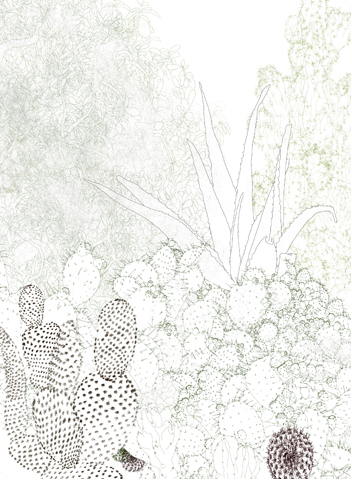 It is a pure act of drawing, evoking a mental map of the natural world. For his gallery shows, Millner prints out his works on a huge scale, allowing the viewer to explore them in all their scope and detail. 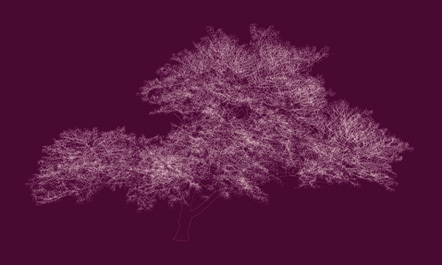 The monochromatic palette focuses attention on the patterns and forms, and lets us marvel at the maze of branches and leaves. 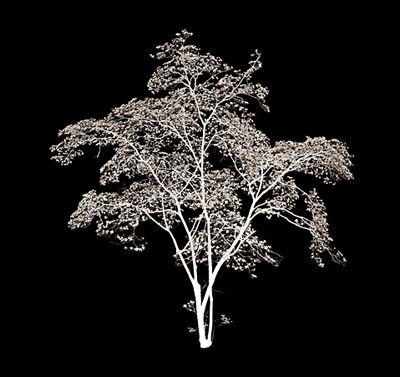 The relationship between the digital and natural world is a something we have only begun to grapple with as a society, and these works are a beautiful example of how art can help us move towards a better understanding of our world. Andrew Millner’s work is on display through October 28th at the Miller Block Gallery in Boston. 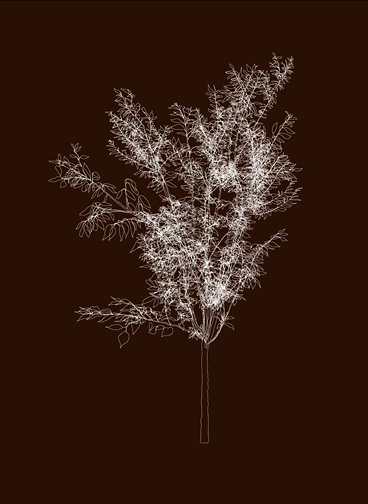 I also encourage you to visit his website where you can see close-up/interactive views of his drawings. Mary Delany was one amazing woman. She lived in England during the 1700s, and in the course of her 88 years she was a gardener, painter, naturalist, art collector, and friend to the likes of Jonathan Swift and George Frederick Handel. At the age of 72 she took up a new art form – paper collage. The image above is made entirely of cut paper. 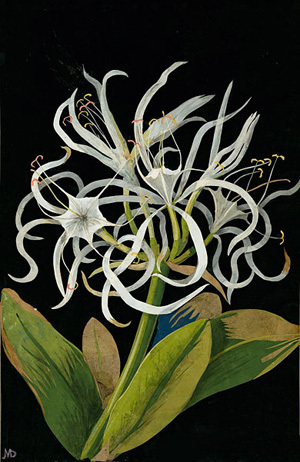 She crafted nearly a thousand of these beautiful collages in the final years of her life, all depicting real plants and flowers. They say she carried paper and scissors wherever she went. Mary Delany is the subject of a new exhibit entitled “Mary Delany and Her Circle” on view at the Yale Center for British Art in New Haven through January 3, 2010. For anyone who thinks it’s too late in life to try something new, she is quite an inspiration. Here is a link to a more detailed review of the exhibit at the New York Times blog. Welcome to my new blog! Here I will be discussing and celebrating the many ways that artists explore nature, focusing on fine art, books, films, and other media. We live in a rapidly changing world full of paradox. As technology bridges distances and allows us to see and experience things we never could before, the natural world is changing and disappearing before our very eyes. Just as we are learning more about our world, we are also becoming more distant from it. Artist and writers have always been inspired by the world around them. 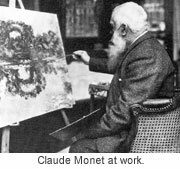 I hope that by calling attention to their works, I will inspire readers of this blog to seek and discover their own marvelous ways of seeing and appreciating the world around them. 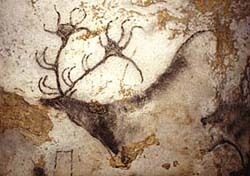 For this first posting, I present some of the earliest surviving images inspired by nature, painted on cave walls over 15,000 years ago. In today’s age of disposable media, will we ever create anything as lasting as these? I look forward to sharing more thoughts on the nature of art in future posts. Let me know if you have thoughts or comments, I’d love to hear from you!